Manlius Public Library - January 19th 1:00 P.M.
- September 29th – our second OLCC / YNLT Monitoring Event at Onondaga Lake. This is also National Public Lands Day !!! Sept 30th , NYS Parks’ FORCES Gathering – Glimmerglass State Park. We are offering free camping and a BBQ at the park the night before the FORCES event, so you can head out there after the OLCC /YNLT to join the festivities. OLCC, Audubon and Honeywell will be planning a bluebird nestbox making event for October. NYS Parks will be supplying the nestbox kits. NLT members may enjoy coming out and participating and/or helping out with this event. At the Annual Meeting a member reported an accumulation of debris and muck at the angler access area along the Muskrat Bay Road adjacent to Oneida Shores. Unfortunately, the accumulation was within the casting range of shore anglers. NYSDEC-R7 Fisheries Manager Dave Lemon provided a response, belatedly reported here. The team of biologists checking the site found that in the first 40 yards offshore the lakebed was covered in largely organic muck (weeds, silts, etc) that had accumulated in the sheltered bay over the winter/spring season. They did not find any significant amount of trash or large material, and beyond 40 yards offshore the cobble bottom was exposed and debris-free. It appears that the temporary siltation is a natural result of the seasonal waves, wind, and currents. Depending on weather patterns, one can expect this accumulaton to change over time. The biologists also checked the culvert and wetland stream on the south side of the road. They found no significant obstruction and no evidence of dumping. We thank the member for voicing an interest, and for DEC in responding. OLA Directors hosted town, county, state, and federal employees who work on our lake interests at the annual August Networking Meeting. Our theme for discussion this year pertained to the BOD's growing concern regarding lake sedimentation. We heard from scuba diver Tim Caza, NYS Canal Corporation hydrologist, Howard Goebel, USGS hydrogeologist Bill Kappel, and NYSDEC investigator Robert Johnson who brought a drone display. Members who attended the 2017 Annual Meeting will recall Guest Speaker Tim Caza revealing 50 dive wrecks that he and his associates located in Oneida Lake. The most significant reveal was that of the state's (Nation's?) only known substantive sunken Durham boat - the type of craft that George Washington used to cross the Delaware! That wreck in Oneida Lake was nearly lost, because after 200 years it was covered by nearly 4 feet of silt, with only inches of its outline protruding above the lake bottom. It was that revelation that congealed the OLA-BOD to address long-standing anecdotes and complaints about the amount of sediment entering the lake, All too often significant sediment plumes are visible beyond the mouths of Oneida, Canaseraga, and Chittenango Creeks. When a landscape is urbanized from open agriculture or forest, less evapotranspiration takes place. Where 50% of the rainfall once infiltrated the soil, and 10% ran off to streams, in highly developed areas only 15% may enter the soil and 55% runs off into the watershed. The landscape change alters not only the immediate area, but also what is downstream. In the three slides below from Howard's presentation, you should be able to interpret the significance of the changes. 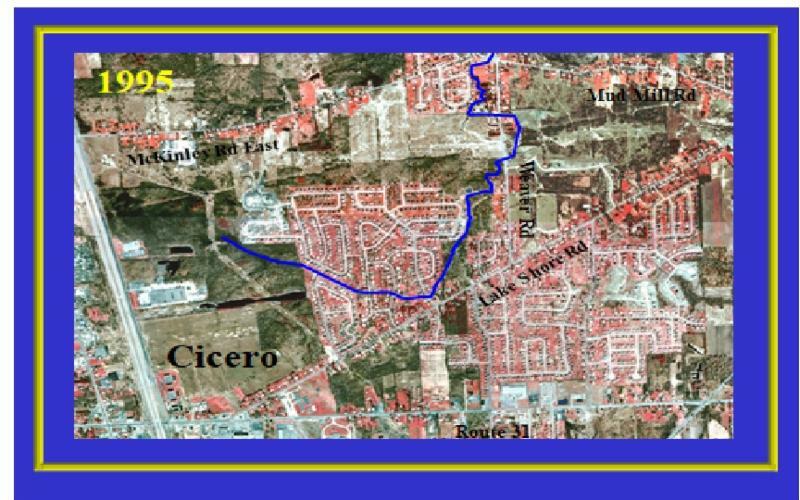 The area depicted (see below) is in Cicero, between Mud Mill Road, Route 31, and South Bay Road. 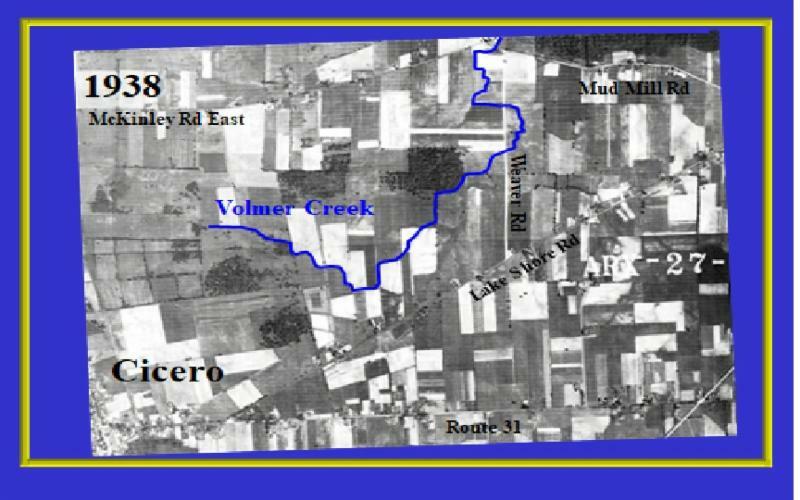 The Oneida Lake watershed continues to undergo major changes. The Oneida Lake outlet cannot easily be modified to increase its hydraulic capacity and reduce flood impacts. Climate Change and watershed development are both impacting runoff. Development should adhere to Storm water Management Principles, Better Site Design, and consider the concept of No Adverse Impact to minimize impacts of Oneida Lake and its tributaries. The message is for ALL town planning, zoning, and codes department staff to better consider not only what happens in their township, but also to recognize that such development accelerates erosion due to concentration of runoff (the stream did not get bigger), as well as deleterious effects on down slope habitats from what is carried in that unfiltered urbanized discharge. Bill Kappel, some may remember, headlined some news when the Tully Valley mud "boiled," during a 1993 landslide, destroying several homes on the west valley slope, and when a 2002 landslide in Sheds filled Limestone Creek with sediment that threatened a major power line and put turbid water all the way downstream into Oneida Lake. 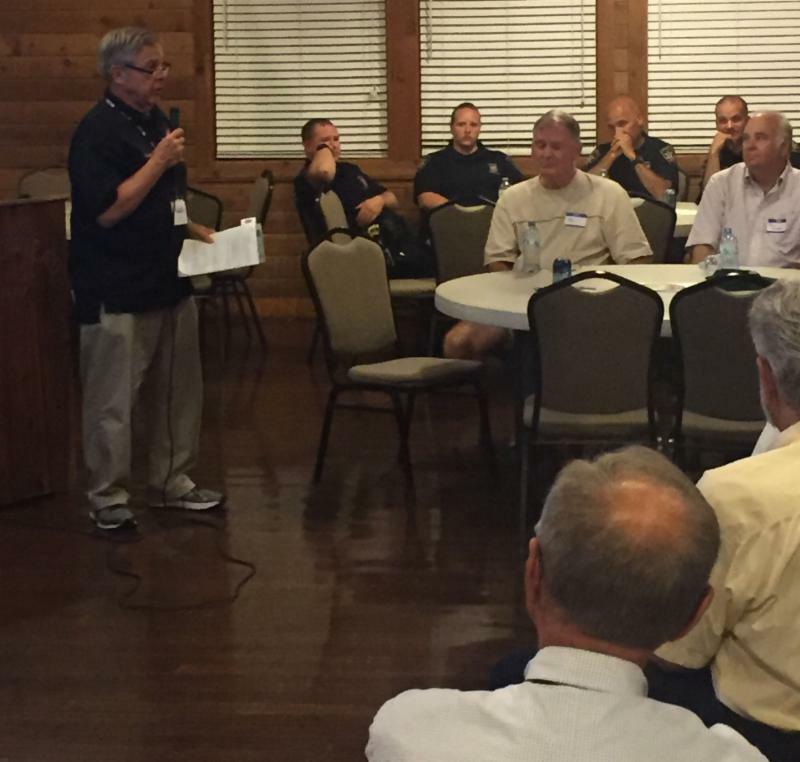 Kappell also addressed the attendees at the networking meeting. Water Quality of Oneida Lake? 1.Modifying land-disturbance practices where possible to slow the movement of runoff which will reduce, in turn, the erosive capacity of moving water. 2. Limit the size of land disturbance at any one time and quickly restore and re-vegetate exposed soils of any type. c.) prioritize implementation of projects to reduce future soil erosion and infrastructure failure. 4. Increase the time it takes for rainfall/runoff to move to nearby streams and creeks – such as water detention (storage), water retention (infiltration) structures. 6. Bottom line – It will take a combined watershed commitment of time and funding to accomplish any effort to retain and limit soil erosion within any watershed. 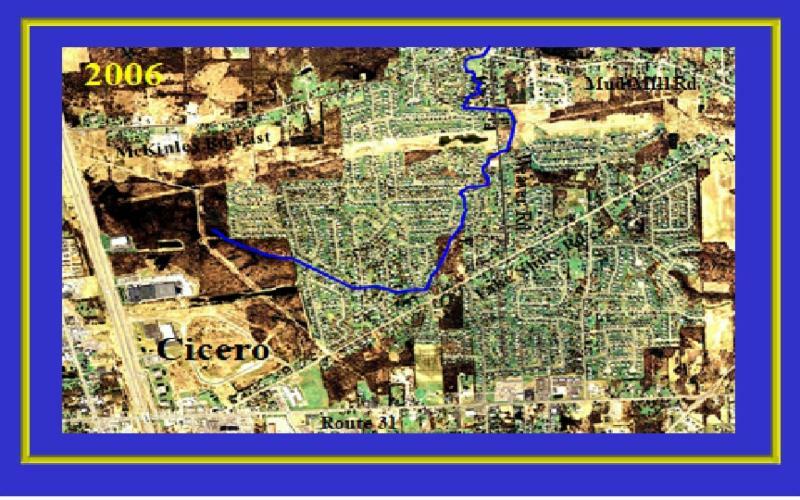 Domack, E.W., Ingmire, S., and Arnold, K., 2004 (draft), Sediment dynamics of the Oneida Creek delta, Oneida Lake, New York, Prepared for the Central New York Regional Planning and Development Board, Syracuse, NY, 93p.